Check the wireless connection on your Asus Zenfone. The first to do is to try to use other devices to connect to the same network, and make sure the wireless connection is working properly, make sure that the wireless router settings are correct. See the setting “Keep Wi-Fi on during sleep”. “Settings” >> “Wi-Fi” >> Touch ” ” bottom >> “Advanced” >> Select “Keep Wi-Fi on during sleep” >> Touch “ Always” to set the Wi-Fi stays on. Check the signal strength of the wireless connection Zenfone. 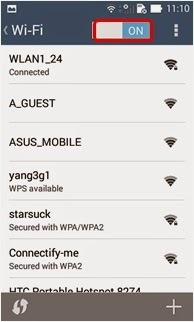 The quality of a wireless network connection zenfone highly dependent on the strength of the signal emitted by the access point. If you want to connect smoothly, asus zenfone connect you to a wireless network that has a strong signal. Check the signal strength of the wireless network icon in the notification. “Settings” >> “Wi-Fi” >> “to turn off the Wi-Fi”. Select “Settings” >> “Wi-Fi” >> “to turn on Wi-Fi”. Select Forget network in your Zenfone. Forget going to reset the network settings on your Zenfone. “Settings” >> “Wi-Fi” >> Press and hold the “Network SSID (Name)” for 2 seconds. Press >> “Forget Network” >> Re-Connect wireless networks when disconnected. Try to reboot the device. Select >> “Settings” >> “About” >> “System updates” >> “Check Update”. Note: After RESET, all data, apps, settings and personal information will be erased. Third-party programs can be the cause of the Tablet / Phone is not stable, it is advisable to do a full reset. “Settings” >> “Backup & reset” >> “Factory Data reset” >> “Reset phone” >> Write “ZenFone” when prompted for a password reset. Touch >>” Erase everything” to confirm. If the steps above still does not work, please try another wireless connection available, or please contact your network provider for technical assistance.